Greg Mortenson is a mountaineer-turned-humanitarian, a New York Times bestselling author, and a two-time Nobel Peace Prize nominee. If we are to believe the recent 60 Minutes investigation and Jon Krakaeur’s report Three Cups of Deceit, he is also a liar. Last Sunday, the news programme released a damning report on Mortenson, claiming that some of his most inspirational stories in his books Three Cups of Tea and Stones into Schools were either exaggerated or completely fabricated. Moreover, a financial statement from the Central Asia Institute (CAI), which Mortenson co-founded in 1996 and is acting executive director, show that only 41% of funds raised actually went towards schools in Afghanistan and Pakistan. According to the American Center for Philanthropy, a charity watchdog, CAI claims that $1.7 million was spent on Mortenson’s “book-related expenses,” more than they spent on all of their schools in Pakistan last year. Since the report aired, a flurry of news reports, opinion pieces, and statements have been released. Mortenson’s long-time critics feel vindicated. His fans are justifiably angry. And there are some who still cling to the possibility that the presented evidence either isn’t true, or doesn’t matter. …the story framed by “60 Minutes” — as far as we can tell — paints a distorted picture using inaccurate information, innuendo and a microscopic focus on one year’s (2009) IRS 990 financial, and a few points in Three Cups of Tea, that occurred almost 18 years ago. You may argue that Mortenson’s half-truths and lies were all part of the storytelling process, that his heart was still in the right place, that his intentions were good. But Mortenson ultimately based his entire narrative on a lie. The reason why American housewives and school children alike were drawn to his inspirational story, why they opened their wallets and gave blindly to “save” schoolgirls in Afghanistan and Pakistan was – at the end of the day – a sham. And if he could lie about the very foundation of his success, we have no choice but to doubt everything. As the dust settles, there is a desire to point fingers and portion blame. Mortenson and CAI deserve the brunt of the anger, for not only veiling the public from reality, but also for using sentimental literature to garner funds, money that was allegedly misappropriated for personal gain. We should also use this as an opportunity to look inwards at ourselves, at our ability to get carried away by a charismatic personality and digestible narrative, in which Mortenson was the John Smith in the Pakistani version of Pocahontas. Rather than society questioning whether good intentions truly equaled good aid, we gave him a platform, feeling warm and fuzzy for the part we indirectly played in saving schoolchildren. This thinking is endemic of a larger problem with charity and non-profit giving, in which show ponies and personalities often sweep us off our feet. We forget that we must demand transparency, and that we need to go beyond giving, remembering instead to give well. We need to remember the people – in this case the children – who our money should ultimately be going to. This means supporting institutions and organizations that aren’t built on personality alone, but on community engagement and sustainability. I never donated to CAI, and I still feel cheated. I can only imagine how Mortenson’s supporters must feel. In Pakistan, the education sector needs vast reform and improvement, and education inequity and low school participation rates are enormous issues. According to Nancy Birdsall, the president of the Center for Global Development, the USAID education program in Pakistan is its largest in the world, with more than $330 million budgeted for FY 2010. However, despite large donor investments in the sector, “Pakistan ranks at the bottom of South Asian countries for educational outcomes,” with issues like education inequity, low participation rates, and teacher absenteeism. Out of the 20 million primary school aged children in the country, one-third are out of school, and of the children who are enrolled, 45% will drop out between grades 1-5. Recruiting highly motivated and talented university graduates and young professionals to teach for two years in under-resourced schools in Pakistan, enabling them to improve the educational outcomes of these students. Teach For Pakistan alumni will work from within and outside the field of education with a lifelong commitment to ensure that all children have equal opportunities to learn, grow and improve their life prospects. Amber Zuberi, the project coordinator for Teach for Pakistan, chatted with me further about the program, noting it was more than just an innovative initiative. It signaled “a paradigm shift that could redefine teaching, leadership, national priorities, and Pakistan.” It is essentially a movement that engages youth to have an impact, to be a part of a larger effort to tackle an endemic socioeconomic issue. In Pakistan, the challenges are enormous and they are complex. Most children are not afforded access to a good education. They are innocent bystanders to a fractured education system, where critical thinking is rarely taught, good teachers are hard to come by, and drop-outs are a common occurrence. The statistics may not change dramatically in our life-time. But efforts like Teach for Pakistan are taking innovative steps to getting us there faster, engaging our country’s youth along the way. They are currently accepting applications for their first class of fellows, and are looking for young and passionate candidates. To apply to Teach for Pakistan [the application deadline is March 15th, and placements begin in August 2011 for two years], click “Apply Now” on their website. Q: The Kilimanjaro Trek was such a unique fundraising idea developed by Friends of The Citizens Foundation (FTCF), and participants ended up raising nearly £80,000 for TCF schools in Pakistan. How did you get involved with the project and what inspired you to do it? Tamreez: I had gotten in touch with FTCF because I was interested in finding out more about TCF’s work in Pakistan. As a side conversation, the trek came up. I thought it was such an exciting opportunity and for such a great cause, so I thought “why not?” I decided I would probably only do it if Asim would be willing. To my surprise, it hardly took any convincing before he jumped in as well! It was later we realized what we had gotten ourselves into when we had to start fundraising and training! But it was the adventure of a lifetime and I’m so glad we did it. Our greatest inspiration was the work of TCF in Pakistan. Their schools are run to the highest standards, competing with elite private schools. For example, the high school pass rate of TCF students is 99% compared to the national average of 60%! They hire only female teachers to ensure high ratios of female enrollment in their schools. Some of the schools have evening shifts for children who work during the day to supplement the family income. The organization maintains high levels of professionalism, transparency and financial accountability. So what really inspired me was their professionalism combined with their ethos that caters to the poorest segments of Pakistani society in very innovative ways. Q: How did you prepare mentally and physically for the trek? T: Mentally, I don’t think it really sunk in until we were in Africa, but we tried our best to read up as much as we could before we went. We spoke to people who had already done the trek. I read online blogs of people’s experiences and their tips for making it through the grueling six days of the trek. Coincidentally, we also read Three Cups of Tea which is American mountaineer and humanitarian Greg Mortenson’s incredibly inspiring story of his commitment to building schools in Pakistan and Afghanistan’s remotest areas. That story really inspired both of us and it was an added coincidence that Greg climbed Kili at the age of 11 and spent the first 12 years of his life in the town of Moshi (our base camp for the trek)! However, nothing could have prepared me for summit night (on the final day for the summit climb, we had to trek eight hours through the night in temperatures that went down to -22 C°). The last hour of the climb, I was crying from exhaustion and the biting cold. I was absolutely convinced that I had frostbite and when I returned, my fingers and toes would have to be chopped off! It’s surprising that I still didn’t give up and kept going. The fact that we were doing it in a big group and saw others who kept climbing, motivated us as well. Also, Asim and I kept pushing each other through the night and somehow when one of us would feel particularly weak or tired or cold, the other would get a surge of protective energy! Physically, we trained for about three months prior to the trek. We would go to the gym a few times a week and also went on long walks. However, the main change was that we started living a more active lifestyle. Gradually, we saw our stamina improve. However, during the trek we realized we should have trained a lot more! For others who want to go on the trek, I would advise doing aerobics and definitely do a few climbs and treks in the months prior to Kilimanjaro. Asim: Looking back, I wish we had done a lot more training than what we did. I personally felt mentally strong from the very beginning; the cause itself was a huge motivation and when the funds started flowing into our JustGiving page, we felt more and more into it. Q: Given that you and Asim raised nearly £6000, how did you go about fundraising for the trek? What kinds of responses did you receive? Asim & Tamreez: Most of our fundraising was online through our JustGiving page. We sent email reminders to friends and family who passed on the link to others. We also organized a bake sale and a Pakistani handicrafts sale, both of which got really good responses. The month of Ramadan came during our fundraising as well and as we all know, we’re all particularly generous during that month, so that helped too! We made sure TCF was eligible for zakat and that we paid for all the costs of the travel and expenses ourselves. That assured people that their money would be going directly to the organization and not funding our trip in any way. More than anything, we were impressed by the generosity of strangers or those who had just met us and found out about the cause. Friends we hadn’t spoken to in ages were some of the first people to donate. Friends of friends came forward and donated anonymously. Family members donated anonymously! It was quite touching. Honestly, the whole experience of fundraising from May to October really strengthened my belief in humanity. Q: About 25 other people were also climbing for TCF – what was the dynamic like among the group and how did that evolve as the trek went on? A & T: We were very lucky that we had an amazing group and that we all got along well. Everyone was really nice and friendly and they all believed in the cause. We would laugh and joke and motivate each other to keep going. The scenery was breathtaking throughout the trip and we would stop for photos which led to many memorable moments. There were about 13 people who joined us from Singapore for the trek and there was a friendly rivalry that developed between the UK group and those from Singapore. As the trek went along, we all started looking out for each other and helping those who weren’t feeling well. It’s quite interesting that when taken away from your usual surroundings and sharing tents and camp toilets with people, you open up and trust each other a lot more than you normally would! We had about 60 local porters and guides on the trek who were absolutely amazing. They would be singing and laughing and teaching us Swahili words and phrases. The organizers from the tour operator, Action Challenge from the UK, who came with us were all really great people as well. They made sure we remained on schedule but still had fun. We had a representative from TCF, Hina Suleman, undertaking the trek with us. She was absolutely wonderful. Despite being as tired as the rest of us, she would still make sure everyone was doing well at the end of the day and even on days when she wasn’t feeling well herself, she would still be motivating and taking care of others! Q: What was the most memorable experience about the trek itself? T: I think the people we met made it very memorable for us. Honestly, if we hadn’t somehow all gelled, we might have been miserable through the ten days of the trip. Climbing and trekking isn’t easy and add to that altitude sickness, dehydration and hypothermia and you could have a potentially very miserable time ahead of you. But like I said, given we all got along so well, we really enjoyed ourselves and knowing that others were going through similar experiences, it really kept us motivated. A: Each day of the trip was unique. 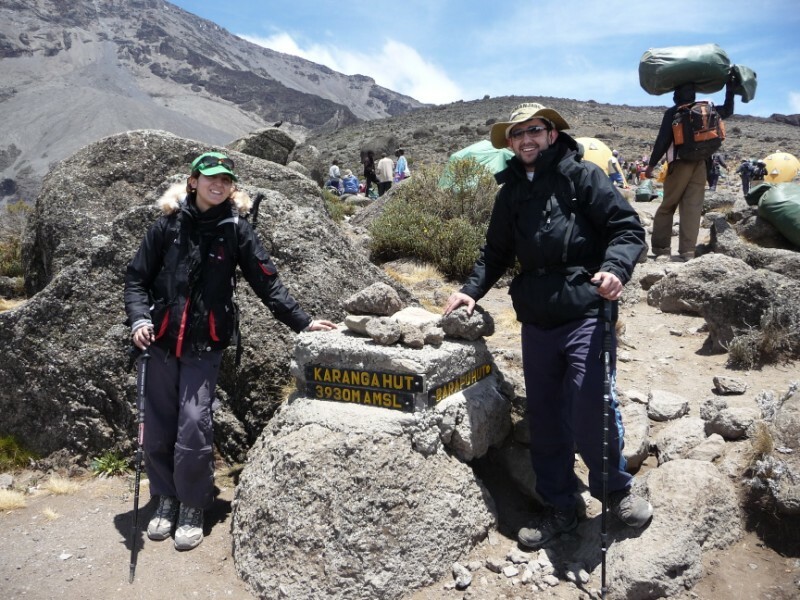 We experienced almost all climatic zones, from tropical weather in Moshi to extremely cold conditions on the summit. We saw thousands of unique plants in the rainforest. It was amazing to see the tree line disappearing behind us. Reaching the summit was one of the most rewarding experiences of my life. But the most memorable experience for me was our daily conversations with the local porters. Each one of them had life story of his own to tell. It not only gave us great insight into the local language and culture, but we learned a lot about the plight of a porter. They have a very tough lifestyle and some are forced into it due to their circumstances. From their strife to earn a day to day living to their determination to achieve the best for themselves and their families; it was an eye opening reminder for me. 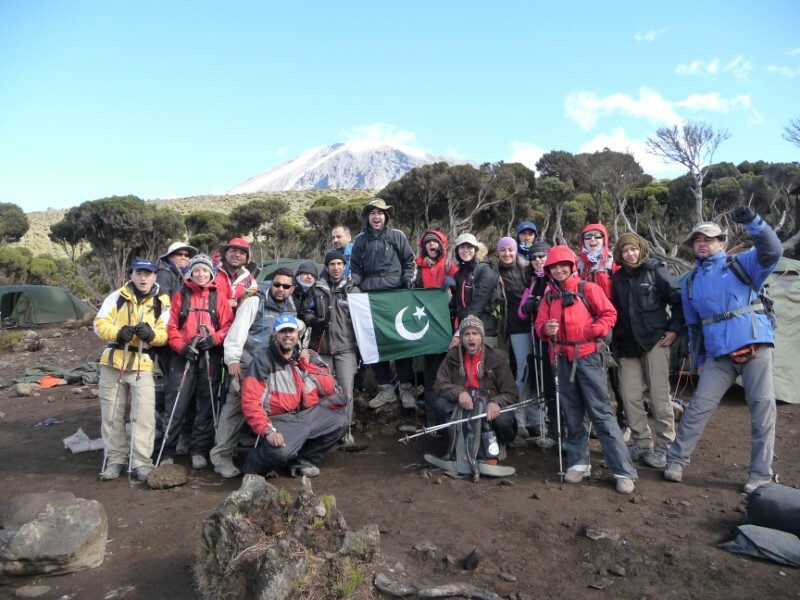 Q: Do you think creative initiatives like the Kilimanjaro Trek can help not just raise funds but raise awareness about the work of NGOs in Pakistan? How necessary are charities like FTCF in leveraging support for local NGOs? T: Oh absolutely! Friends of The Citizens Foundation, a UK registered charity and independent from TCF, serves as TCF’s fundraising arm in the UK. Similarly, TCF-USA does the same for it in America. These organizations go a long way in building support for the TCF and creating awareness about the cause. They are one of the most transparent, professional and efficient organizations I have ever come across. Working with them is a pleasure. So in a sense, they restore your faith in Pakistani organizations and those working for Pakistan. Also, because they genuinely care and translate it into actual work on the ground, I think they serve as great ambassadors for not just the NGOs, but our country in general. A: It’s definitely a great way to raise awareness and hence more funds. It worked in our case. So many people we approached never heard of this charity before and that included Pakistanis. FTCF organized a similar trek to K2 base camp a couple of years ago and that team raised a similar amount too. FTCF no doubt is doing great job in raising awareness in this region. It is one of the biggest fundraising wings of TCF. If you would like to learn more about The Citizens Foundation, visit their website. If Asim and Tamreez’s story inspires you, you can donate via their JustGiving page, or if you’d like to donate directly to TCF, please visit their website, TCF-USA, or FTCF. On Facebook and various blogs site, I’ve seen numerous friends cite Imran Khan’s passionate rhetoric advocating for negotiations with the Taliban/militants. According to him, because we can’t tell them apart from civilians, the government must not attack Waziristan or any other area. We need to negotiate or else there will be more mayhem. As I clicked through Dawn’s photo archives of terrorist suspects captured in the past week, I couldn’t agree with him more. How do we tell them apart? Who is with us and who is against us? At the same time, I feel Imran Khan’s negotiation strategy is a decade too late. I’m not saying our strategy should be ‘Wham bomb thank you Ma’am’ – that was the half-hearted strategy of the past military rule. Nor am I happy to see innocent civilians become collateral in this military offensive and hear of the rising death toll. What we need during this war is not the next step, but the parallel step. We need to address what has led to all of this, and by we, I don’t mean our inept politicians and pseudo- military-personnel-turned-rulers. I believe we refers to Pakistan’s citizens, the next generation, you and I. As many of us know, what has driven militancy is a combination of factors – poverty and a lack of education and development that has been exacerbated by an extremely narrow ideology. Our past apathy towards the two most under developed regions of Pakistan—Balochistan and Waziristan—has been the most damaging. These areas have a weak basic infrastructure— mud roads, ghost schools, dilapidated hospitals, lack of law and order, and hardly any human rights—which makes them an ideal breeding ground for extreme ideologies. Many scholars and politicians, particularly Imran Khan, have argued that the people in these areas have lived in traditionally lawless societies for centuries. Given this ground reality, they say, we must respect their traditions and work within this context. I disagree. As T.S Elliot aptly noted, “A tradition without intelligence is not worth having.” These traditions ignore issues that have allowed a zealous ideology to mushroom all across Pakistan, especially in rural Punjab. Take the the young girl who was flogged by the Taliban in Swat, for example. Do we want these traditions? Do we want men/women/girls being bartered to resolve disputes? Do we want our people to see a continuously distorted narrow vision of what the world is? I certainly don’t. Therefore, as the war wages on, and our President, Prime Minister and senior opposition leaders hide within their mammoth securities barricades, it’s time to leave aside our materialistic lifestyles and work towards changing our country. I’m not talking merely of monetary donations for social development; I’m referring to one simple thing — Education. Look around you; most of us have people working in our households. A question to ask is whether their children go to school. Do we know whether they can afford their education? And most importantly, do we know what they are being taught? Many of us will unfortunately say yes to only one of those three questions. So go and approach the man working in your house and ask how many of his children attend school. Help him finance their education. More than 75 percent of our country is illiterate and less than 2.5 percent of Pakistan’s GDP goes towards education. To stem the growth of militancy, we can start by educating our people. The Cuban state has a monopoly on all aspects of production of educational materials – design, publishing, and distribution. As a consequence, the state is able to keep costs low, address the learning needs of the poor, and distribute all educational materials free. There is an emphasis on properly trained teachers, which accounts for most of their educational budget, rather than an experimental teacher model. The Cuban national curriculum is continually reformed and adapted to local realities. All school calendars vary according to local production schedules. This allows flexibility and avoids dropout rates in schools. In addition, the Cuban model also promotes technical and vocational learning in secondary school that allows students to learn about certain professions. Perhaps in order to expedite this reform, Pakistan will need additional funding, but I believe it is a small price to pay in order to stem existing or future ideologies. Therefore, if we make the government take this parallel step amidst our current conflict, we will transform our incumbent education system in the years to come and subsequently create a new “liberal” ideology that enlightens and drives our country forward. The contribution is the sole opinion of the author and does not necessarily represent the opinion of CHUP. If you would like to contribute a piece to CHUP, please email Kalsoom at changinguppakistan[at]gmail[dot]com. Pieces should be no longer than 800 words please. For past contributions, click here. Is militancy declining? The issue is not black-and-white, particularly since a survey conducted by Gallup Pakistan last month found that 59 percent of Pakistanis felt the greatest threat to the country was the United States [a statistic not helped by continued U.S. drone strikes or rumors of an increased Blackwater presence in Pakistan]. Meanwhile, only 11 percent of respondents said Taliban militants were the biggest threat to Pakistan. Celebrities have often lent their star power to a cause – from Bono‘s efforts to rally Americans to fight AIDS and global poverty to Angelina Jolie‘s work as UNHCR Goodwill Ambassador. In Pakistan, pop star Shehzad Roy established Zindagi Trust, a not-for-profit organization that aims to provide education for underprivileged children. The organization has established 29 operational schools throughout the country, educating over 2800 children. On Thursday, Dawn reported that Roy was recognized for his philanthropic work when he was awarded the 2009 Patricia Blunt Koldyke Fellowship on Social Entrepreneurship by the Chicago Council on Global Affairs. Not too long ago, I interviewed Roland Stevenson of RiverIndia, a company that leads kayaking expeditions in India and throughout the subcontinent. This past November, Roland led a team on an expedition down the Indus River in Pakistan, the longest river in the country and the 21st largest river in the world in terms of annual flow, [click here to read the interview]. While on the trip, considered one of the most successful descents of Indus River’s Rondu Gorge, the team filmed a documentary entitled, Hotel Charley IV: At Your Own Risk. The trailer of the film, shown below, not only highlights the breathtaking natural beauty of our country, but also the people-to-people understanding that was fostered during this expedition. On a day like Earth Day, meant to inspire us all to appreciate the world and people around us, it is important for Pakistanis to be proud of not just our natural beauty but also the tenacity of our people in the face of daily violence, rising extremism, and political turmoil. Happy Earth Day everyone.